Guernsey must make the final of the ICC World Cricket League Division Six, according to the chief executive of the island's cricket board. 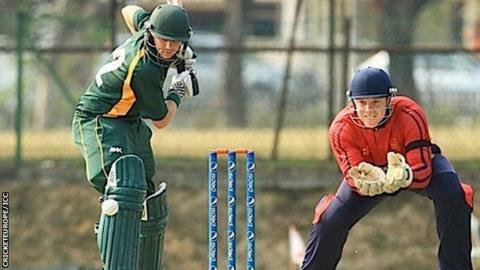 Guernsey have been drawn in a pool with Botswana, Suriname and Fiji as they try to make it out of the bottom tier of global cricket's one-day tournament. The tournament's two finalists will win promotion to Division Five. "Making the top two is critical, if we win the final it's a bonus," Mark Latter told BBC Sport. "It gets us back alongside Jersey in World Cricket League Division Five, albeit the structure from 2016 has yet to be confirmed. "But in terms of world ranking obviously doing the best in this tournament is critical." Guernsey have never met Botswana before, but have played Fiji and Suriname, beating the Fijians by 108 runs in 2011 and Suriname by 263 runs in 2009. The islanders were relegated from World Cricket League Division Five in Malaysia last year and won Division Six when they were last at that level in 2011. September's tournament will be held in Essex, with the English conditions likely to favour the Guernsey side. "Essex in September is far preferable to Malaysia in February from the cricket perspective," said Latter. "We can go straight there off the back of our own season so we're prepared as well as we could be rather than going out to 80 or 90% humidity having not lifted a bat for eight months."